My mother always encouraged us to have music on in the kitchen. While she baked or did her lesson plans for her art classes, or made dinner. Chicago, Huey Lewis, and Disney soundtracks were blasting in our car rides back and forth to dance lessons, or girl scouts, or my brother’s karate lessons. My mom was a superhero. My mom is still a super hero. If I can be half the mother she is, I will consider myself a lucky woman. 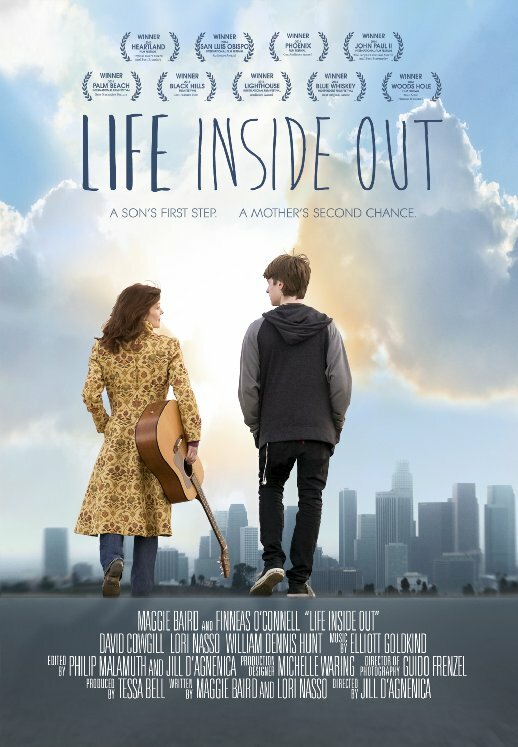 In the new film LIFE INSIDE OUT we are privy to the perfect example of how creative mothers reach their children in very different and very special ways. The talented acting/writing team, Maggie Baird and Lori Nasso, bring to life a story of so many mothers who have lost their own identity to raising their children and keeping their families intact. The story comes from Baird’s true life experience with son Finneas O’Connell. When Baird’s husband was forced to take a job that kept him away from the family, it took an emotional toll on then 12 year old Finneas. Once Maggie rediscovers her songwriting roots, Finneas follows suit. Much to everyone’s surprise, Finneas is a bit of a musical prodigy is his own right. Writing his own songs allowed him to creatively process his own angst and bond with Maggie on a new level. This is the basis of LIFE INSIDE OUT. When a family struggles to make ends meet, Laura (Baird) finds her old guitar. This over worked Mom decides to take up writing again and attend open mic nights. Son Shane tags along if only to avoid a fishing trip with his aggressive father and older twin brothers. He encourages Laura to continue her progress and picks up the guitar only to discover he has quite the ear. Mother and son use music to speak to each other’s needs. Maggie is so honest in her performance. To me, her voice and story-telling and songwriting style is reminiscent of Shawn Colvin. She has a humorous yet elegant air to her folk song style. Finneas has a gift. His music is heartfelt and incredibly catchy. I watched the film on Thursday and for the next 24 hrs, I was singing two of the big songs in the film, over and over. If you are a singer, you’ll understand that doesn’t always happen. When you connect to music in such a way, it is pure joy. It is so rare that you see a movie about the relationship between mother and son. This film is a rare gem. The combination of immense talent from the entire ensemble cast and the beautiful songs from Maggie, Finneas and the rest of the Fais Do-Do open mic singers is nothing but a winner. It’s some of the most genuine story-telling and expression of love I’ve seen on screen in quite some time. The movie was filmed over the course of 16 days. The house in which the film is set is Maggie and Finneas’ actual home in California. The twins’ bedroom was really the bathroom. While filming at Fais Do-Do, Maggie, Jill and the producers were almost arrested for not having the proper permit. Maggie’s mother had a full scholarship to a music school but gave it up to marry at 19. Not only can Maggie act, write, and sing, but she also bakes like a pro. She used to bake wedding cakes professionally. Maggie and Lori Nasso‘s husband were both members of The Groundlings. He introduced the two. Maggie and Lori first thought that they would make LIFE INSIDE OUT on an iPhone. The famous coat Maggie wears in the film was bought at a county fair. Finneas’ hair inspired one of Jason Segal‘s improvised lines in Bad Teacher. There are three pianos in the house that had to be moved around during filming. All the guitars also had to be hidden in the attic. Skip, the music store owner, is Maggie’s real life husband Patrick O’Connell. To promote the film, you can get guitar picks with LIFE INSIDE OUT printed on them, as well as Maggie’s Cinnamon Roll recipe. Here are some of the songs from the film!!! LIFE INSIDE OUT has so much heart. This story will resonate with you long after the credits have finished rolling. This portrayal of real life love and passion is one to cherish. If you are in the NYC area, go catch this great indie at The Quad Cinema this weekend. Until then, enjoy the musical stylings that is has to offer and let the filmmakers know you want them in your city. This entry was posted in Clip, Events, Film Festival, Go To The Movies, Heartland Film Festival, Interviews, Liz, New York City, Poster, Reviews, Trailer, What To Watch This Week, Woman Lead, Women in Film and tagged Award Winner, Fais Do-Do, family, Festival Circuit, Finneas O'Connell, Indie, interview, Jill D'Agnenica, LIFE INSIDE OUT, liz whittemore, Lori Nasso, Maggie Baird, music by Liz Whittemore. Bookmark the permalink.